← … blue steel Olmo for an outstanding bike killer, a lipstick red, lugged Cinelli SuperCorsa, and PB and J ’til you bleed! 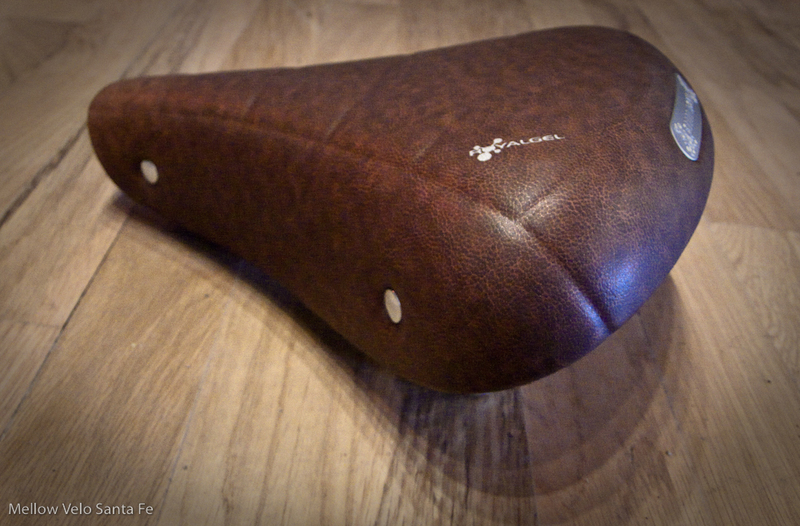 Show us a vintage-looking saddle and we are like moths to a flame! The Selle Royal Classic saddle with RoyalGel. This belongs on your townie. Our Continental/ Selle Royal rep Jeff Eisner brought us this lovely faux-leather saddle that would look just as good on an old bike as it would a new Masi Soulville. Royalgel is an exclusive polyurethane matrix product, the only gel which doesn’t break, doesn’t harden, and doesn’t age. Comparative pressure distribution tests prove that Royalgel™ padding guaranties the highest level of comfort, reducing pressure peaks by up to 80%. A better distribution of the weight on the entire surface of a saddle with Royalgel relieves both the prostate/pubis area and the “sit bones”. … that is a mouthful, the saddle is great!